I recently had the pleasure of sitting down with my friend and fellow bodyworker maverick, Karen. Karen’s been helping the fine folks of San Francisco feel better in their body for over a decade, and she’s truly a wealth of holistic wellness knowledge. Being the gentle bodywork nerd that I am, when she told me she was a Certified Rosen Method Bodywork Practitioner, I HAD to try it. I’d heard of this modality that combined talk and gentle touch, but what the heck did that look and feel like? And what did it DO? Karen’s extremely gentle, slow and informed touch, combined with astute verbal inquiries and observations, created a bodywork session unlike any I’d received. I left my Rosen session feeling deeply relaxed, with a new perspective on my body and health. There are very few modalities that I know of that combine talk and touch on purpose. Each by themselves can be unbelievably powerful, but there’s a special magic that happens when you sense what you’re feeling simultaneously with your body and mind — with the guidance and support of a skilled practitioner — especially if you’re in the process of healing deeper or more chronic issues. When we connect the intellect of the body and mind to explore the felt and the yet-to-be-felt parts of our lives and bodies, the results can be surprising and remarkable. 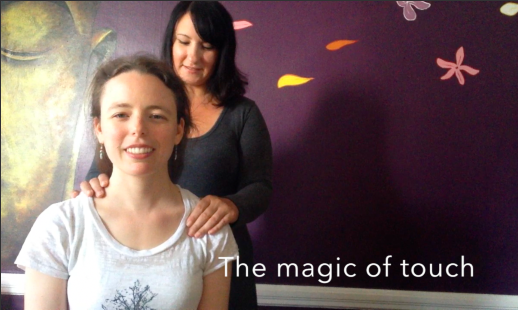 : see ME receive a small dose of Rosen Method magic! Our interview is only 10min, so I hope you’ll take a pause with a cuppa delicious coffee or tea and join us! P.S. If you know someone dealing with chronic pain, chronic depression, grief or unresolved trauma, and you think they might be open to it, show them you care and forward this post along. It might just be what they’re looking for, or spark a new perspective on their healing.